A positive user experience is the most important factor when visiting a business’s website according to 95% of people surveyed. [i] But what if you can’t see the website or hear its videos properly? An estimated 8% of the male population has color vision problems[ii] and approximately 15% of American adults (37.5 million) aged 18 and over report some trouble hearing. [iii] As a website owner, ensuring your website and apps are user-friendly and accessible to all makes good business sense. But did you know that accessibility may also be a crucial part of ensuring ADA compliance? ADA compliance refers to the Americans with Disabilities Act 1990 which states that all people, including people with disabilities, have sufficient access to public areas. This right to access is now being applied to the online world as well. While there have been no official changes to the ADA, plaintiff attorneys have been incredibly successful arguing that Title III of the ADA applies to websites. This means that business owners would be wise to make sure their websites and mobile apps are accessible to people with disabilities. Before 2015, there were very few federal lawsuits filed over allegedly inaccessible websites. [iv] In 2017, there were more than 800 of such cases filed. [v] In 2018, that number nearly tripled to 2258 federal lawsuits- a 177% increase from 2017. [vi] Plaintiffs filed these federal ADA Title III lawsuits in fourteen states in 2018, with New York and Florida filing the most by far. 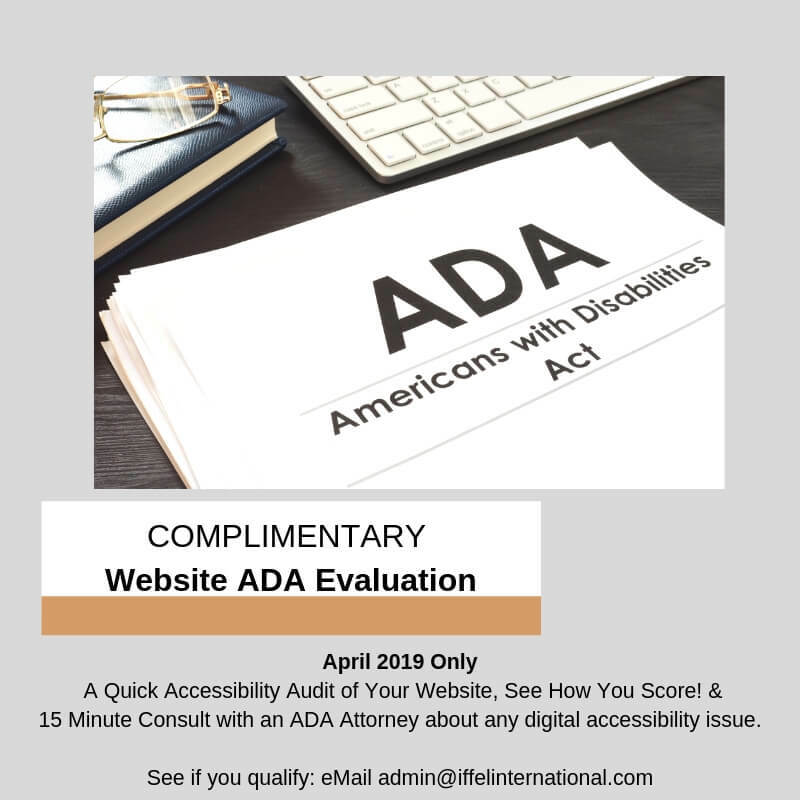 The fact that the California federal courts only had ten website accessibility lawsuits filings in 2018 may be a surprise to some since California continues to lead the pack in the number of all ADA Title III lawsuit filings in federal court. [vii] However, it appears that plaintiffs filed their new cases in state court after a federal judge in the Central District of California dismissed a website accessibility lawsuit against Dominos’ in 2017. [viii] The Ninth Circuit reversed that dismissal in early 2019, making California federal court an attractive venue for plaintiffs once again. [ix] The Ninth Circuit’s ruling will likely cause the number of website accessibility lawsuits in California federal courts to increase dramatically in 2019. While most cases end with a settlement agreement between two parties, the agreement may involve paying for damages or fees and will certainly involve making changes to a website to ensure it is accessible to all individuals by a certain date. [x] For example, Netflix was successfully sued for ADA non-compliance in 2011 when the National Association of the Deaf (NAD) claimed that the lack of closed captioning on the platform was discriminatory against deaf people. Netflix was ordered to caption its streaming video library by 2014, and to continue captioning content published thereafter. It also paid the NAD $755,000 for legal fees and damages. [xi] The cost of a good, inclusive web design may be pricey, but it is surely minimal compared to the potential fines in an ADA non-compliance lawsuit. Technological advances are rapidly changing virtually every business and the way of daily living across the globe. It’s crucial for organizations and businesses to do everything they can to thoughtfully accommodate the blind, the color blind, the hearing impaired, and everyone else who is using their technology. [iii] Blackwell DL, Lucas JW, Clarke TC. Summary health statistics for U.S. adults: National Health Interview Survey, 2012 (PDF). National Center for Health Statistics. Vital Health Stat 10(260). 2014.